If you plan a holiday in Split, you may want to prepare yourself for the trip and collect all the useful information you can get. We wanted to make it easier for you so we have made a list of 20 things that could come in handy when travelling to the most beautiful city in the world, as locals like to say. 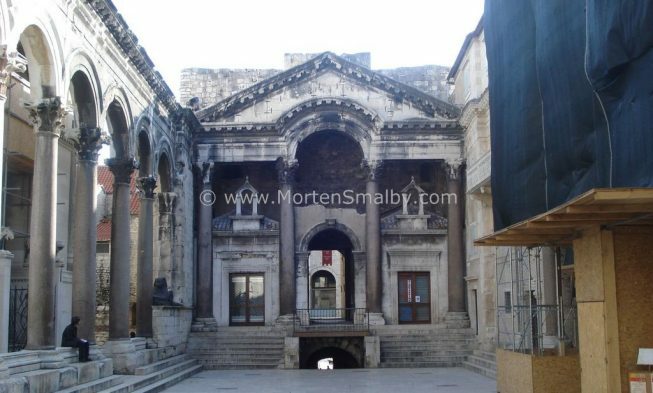 Diocletian Palace: Over 1700 year old palace built for emperor Diocletian now forms the Old Town. It is one of the best preserved monuments from that time in the whole world. There are few must-see sites like the Cathedral of St Domnius, Temple of Jupiter, Peristyle, Vestibul, the four gates and the substructures. 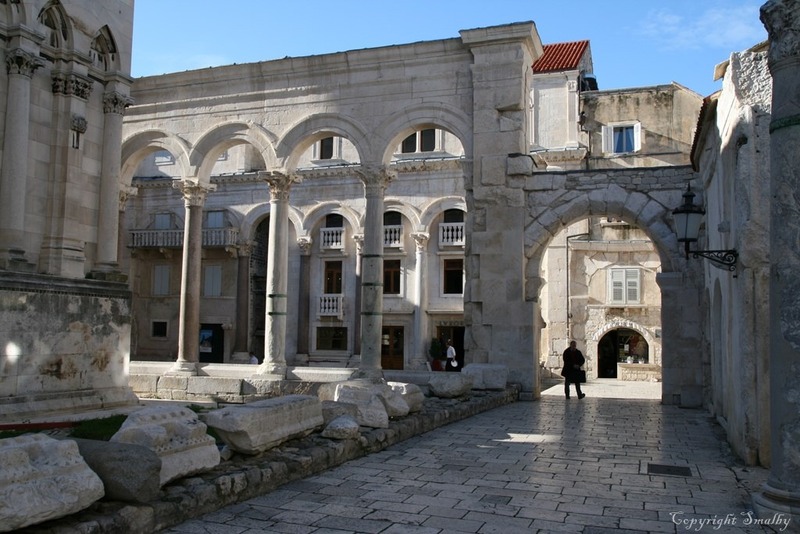 The substructures are one of the best preserved ancient complexes of that kind in the world and enable a true reconstruction of the way Diocletian’s chambers looked like. Museums: In and around city center, you can find several museum that are worth the visit. Our recommendation is the Ethnographic Museum, Archaeological Museum and Split City Museum. Another museum you shouldn’t miss is Mestrovic Gallery with hundreds of sculptures, plan and drawings of this Croatian sculptor. National theatre: Split has some very skillful actresses and opera singers, so check out the schedule for upcoming performances. During summer, there is a festival – Split Summer Festival that hosts top performances and most often, it is held open-air. City Park Marjan: Renting a bike is the best way to discover the city park, the green oasis of the town. There are several viewpoints and from the top you will have an excellent view over the city and the islands. The park is surrounded with beaches so it is an ideal place to spend the whole day. Markets: Visit the fish Market at Marmontova street and the green market just outside of the west side of the Palace in order to buy fresh fruit and vegetables, flowers, local cheese, olive oil and rakija. Markets are open every day from 6.30 in the morning. Festivals and events: During summer, Split has a number of cultural events like Days of Diocletian, where people dress up like Romans and eat and drink in the basement of the palace. Other events include the Split Summer festival that was already mentioned, Split Music Festival that happens at Prokurative Square that also has a child version of it at the same square. The most popular among all music festivals is Ultra Music Festival, it is a world-famous festival that attracts thousands of visitors every year. Salona: Visit the ruins of ancient roman city of Salona which once was 3 times the size of Pompeii. Salona is situated few km outside of Split center and can be easily reached by bus. 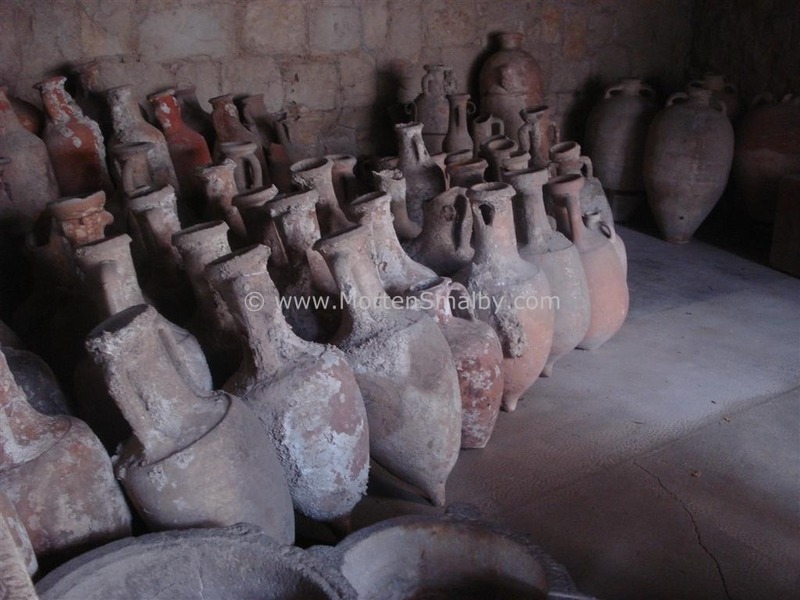 This archaeological park testifies the importance of this colony under Roman rule. Restaurant: Almost every restaurant in Split serves good and quality homemade food. Dalmatian cuisine is part of Mediterranean diet that is known as one of the healthiest and most delicious in the world so our recommendation goes to restaurants that serve local dishes. Fast food: Close to the Bacvice beach, you can enjoy original Bosnian cevapcici at the place called Ba-ce. Cevapcici are spiced meat roles served in a bread with fresh onions and kajmak. Another place to try them is Kantun Paulina and you should visit both of them to decide which ones you prefer. Rizzo sandwich bar serve really good sandwiches in homemade bread and you can find them on 4 different locations in Split. Nightlife bars: Split is a vibrant city, especially during summertime. After dinner, pick a bar and have a drink or two. The whole city center is filled with cafes and bars where you can stay until early morning hours. Riva waterfront is the place where you can warm up for late night out in Split. Later people gravitate to the bars inside the walls of the palace so Charlie’s bar is the most popular place with younger visitors, and if you are a cocktail lover, head to Pun Kufer Cocktail Bar. For numerous beer options, check the Fabrique Pub. Night clubs: After midnight, it is time to start with the real party in one of the clubs. The most popular place to party is Bacvice beach. There you can find several clubs like Tropic Club and Bacvice Club; they are absolutely number one when it comes to partying during summer. Another very popular and cool place is the Central Club that is a great alternative to Bacvice beach clubs, it offers a bit more classy experience. Kocka is the club for alternative crowd. 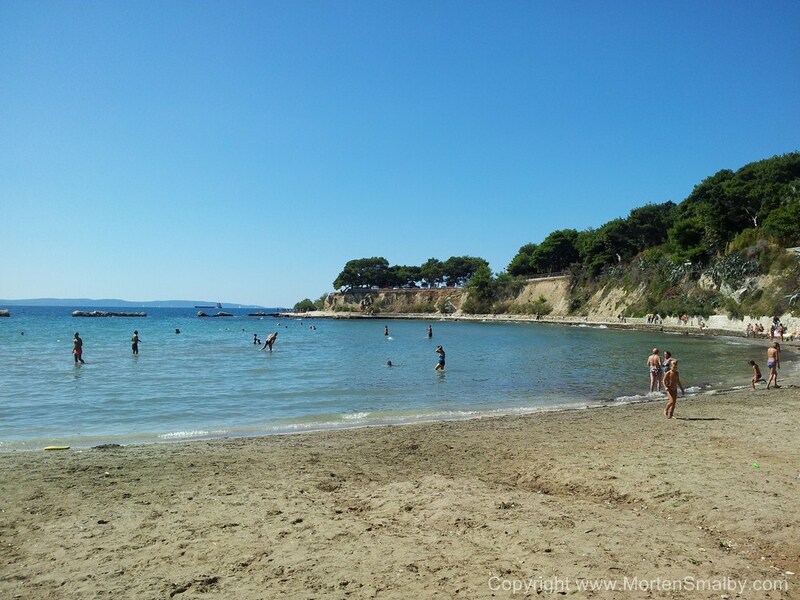 Beaches: There are several beaches in Split where you can soak up the sun and swim in clear water. The most popular and the closest one to the city center is definitely Bacvice beach. There are also beautiful beaches along Marjan hill so you should read more about beaches in Split in order to decide which one you want to visit first. Rafting: The most popular adventurous experience in the area is rafting on Cetina river. If you are an adrenaline lover, it is a must-try! Read more about the whole rafting experience. Klis: The Klis fortress is a medieval fortress that has become worldwide popular after the famous TV series was filmed there. Yes, we are talking about Game of Thrones. On Kliss fortress, there is also a medieval festival happening every year at the end of July. The ticket for the fortress is 40kn. Trogir: Another historic and picturesque place has earned its place on the list. The whole city center is a Unesco World Heritage Site. 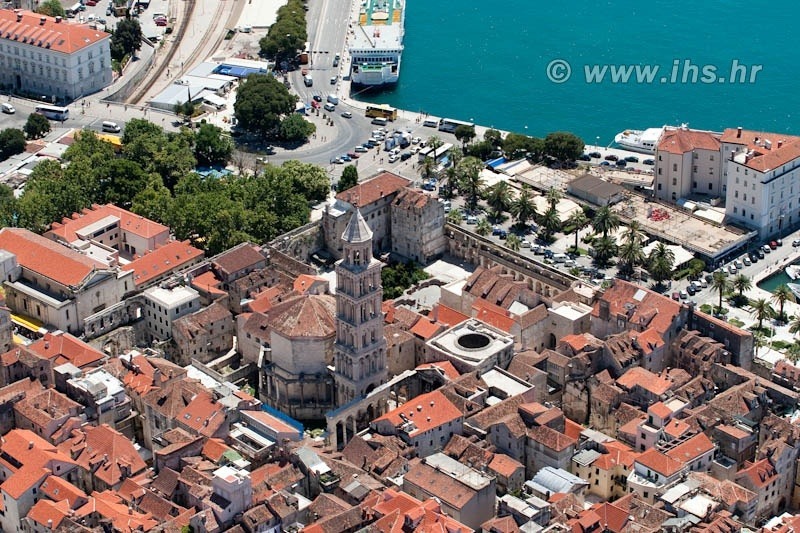 Trogir offers amazing landmarks and the most important one is the Cathedral of St. Lawrence. Since the city itself is connected to the island and the mainland with bridges, it is pretty clear that there are some beautiful beaches around. Brac: Take a one-day trip to the island of Brac in order to get a unique island experience. Personal recommendation is to rent a scooter in Supetar and explore the whole island. The highlight of the island is the most famous beach in whole Croatia – Zlatni rat or the Golden Horn. Island abounds with small, private beaches so take your time to explore some of them. Hvar: Another island you should pay a visit to is Hvar island, often called as the Queen of the islands. Amazing landscapes, crystal clear water, delicious food and nightlife; this island has it all. National park Krka: One of the most beautiful Croatia’s landscapes is only an hour away from Split, it is Krka Waterfalls National Park. It is the second largest national park in the country and it is absolutely magnificent. Everyone should visit it at least once in their lifetime! Shopping: The main shopping street in Split is Marmontova street, it is located in the heart of the city. Small streets in the old town are full of little shops with all kind of different things. If you prefer all stores under one roof, there are several shopping malls in Split: Joker mall is the closest to the city center and City Center One and Mall of Split are located in the outskirts of the city. Sailing tours: Seeing Split from the sea level is a memory you will never forget. There are several options to do a sailing tour in Split, you can choose between half-a-day tour, a sunset tour or a tour on a pirate ship – it is especially attractive for the youngest. The best way to discover all the things you can see, do and experience in Split is to visit it so don’t wait too long, it will be worth it! Thanks Elna, glad you like my site! we’re thinking of hiring a villa in either split or Dubrovnik – not been before – 3 teenage boys – is there enough for them to do in split? I am going to split for 6 days in July with 2 other people. We have booked 2 nights in the old town in split and would like to stay somewhere near a sandy beach for the rest of the time. We are looking for somewhere where there are things to do ie restaurants, clubs, bars, culture, day trips – plus the beach. Initially we were thinking of going to Hvar but I am finding it difficult to find good accommodation that isn’t too expensive. Also just realised there are no sandy beaches there. If you have any recommendations it would be greatly appreciated!! one option could be to stay in Spilt the whole period, you have one sandy beach in Split and you have sand beaches in Omis which is 30 minutes bus ride from Split. in terms of Restaurants, clubs, bars, culture and day trips, Split is an excellent base. Another place could be makarska Riviera, you although don’t have any sand beaches, but you have some very nice pebble beaches in the area. Me and my partner will be flying to zadar next week and will be staying for 4 nights. just want to know is it better to book a stay in zadar or split. Also with one will be cheaper. i enjoy to include being served with breakfast, does it do much difference in price? Both Zadar and Split are very nice cities, so i comes down to each person which one they find nicer. From price point of view there should not be much difference. My experience is that it is better to take care of breakfast your selves, you have plenty of bakeries and coffee bars around, if you although insist on having breakfast where you sleep, i would guess if would cost you 3-5 Euro extra per night. A couple of friends and I are thinking of going to Split in the middle of May. What is the nightlife like at that time of the year? Are there a lot of clubbing opportunities? Are there any tourists? What about. nightlife in early June in Split? Also what are the temperatures during the day ? Is it warm enough to swim in the sea, etc? Thanks, great blog! the nightlife in early June is normally quite ok, of course not like in July and August. Daily tempratures should be around 25 degrees celcius, and you can for sure swim in the sea. Hello, in our company of fresh flowers, Roses Sky, in Bogotá Colombia, works PAOLO SVERKO and we want to find contacts of bigimporters of fresh flower. We exports carnations, roses, and tropical flowers. Can you help us to find a list or internet adresses or just adresses to try to find importers, a list, a chamber, a group? that is a difficult question, i will see if my colleges have any idea how to help you on that one, if so i will add a comment here later. I am trying to find details of the Summer Festival for this year in July August 2010. What is in in Split and Dubrovinik during this time. Hi Pamela, expect information to be available around April, we will update the Split summer festival program as soon it is finalized. Good place to start exploring for Split. Thanks. The rent a bike link is not working. Could you update it please? My question is about roasted lamb.. janjetina-if i’m not mistaken. Last year i had the best roasted lamb in Zagreb. Any recommendations for Split and Dubrovnik? Hi Herri, I am not a Lamb eater my selves, but i know that the lamb in Klis is very popular, also i would think that restaurant Kapitano in Ston (60 km before Dubrovnik) is a good address for Janjetina. Can anyone tell me how to watch a benfica football game on TV in Split today? sorry couldn’t reply before now, my best guess would be Cafe Libar on Sperun ( end of Riva towards Marjan), i know they have dreambox. hello there I am planing on going Croatia on jan for 4 days…is there alot to do in winter or..should i wait for summer season? thnx. well there is winter here, especially in the central parts of Croatia, here there is lots of snow, if you go to the sounthern coastal region (Dalmatia) you will have no snow but it is still quite cold. I would recommend going in Spring e.g. April or May or of course in the summer months. We fly out to Croatia in a week, to Split. staying at Hotel Sandra, do you know of it? Also wondered what a day trip to the islands cost approximately? and is it worth hiring a car to see Dubrovnik? Will let everyone know my experiences here too. I suppose you me house Sandra? is very close to centre i dont know about service and interrior, but in terms of location it is great pick. Trip to Island, you mean organized or on your own? you can “make” your own day trip to either Island Brac or Island Hvar, Brac is 45 minutes, Hvar +2 Hours with the ferry, must admit didnt have time to update all ferry schedules so I cant tell you exactly how you could arrange it, if you do your own trip, you can do return trip for less then 100 kn, if you join organized trip if will be 300 – 400 kuna (my guess). Dubrovnik, well the city is very beatiful and the view on the drive along the coast is stunning, so if you have the time i would for sure recommend you doing a day trip to Dubrovnik. be aware that you have 4-5 hours drive in each direction so you will have to leave early to have time to see wall and other sights in Dubrovnik. depends how you define affordable 🙂 Hotels in and around the city centre are quite expensive but of course extremly convinient. Best advice would be to browse the net and find a few hotels which have ok Rates, i can then give you my opinion on them. Your articles are very informative. My husband and I are planning a 1 week trip to Croatia and Montenegro in September. We are thinking about staying 2 nights in Split, in the Old Town. Can you recommend an itinerary of sights and activities in Split? Do you suggest taking a ferry out to spend the day in Hvar or is it better to stay a night in Hvar? Considering we only have 2 days in the area, do you recommend visiting one of the other islands instead of Hvar? We are going crazy trying to fit everything in but of course we realize we cannot see it all. Any help would be very much appreciated. Hi Melissa, you can easily spend two days in Split i am sure you will enjoy. A one day trip to Hvar is quite a bit of traveling as you would have to take car ferry (2.5 hours) to Stari grad and then travel with bus to town Hvar which in total is abot 3.5 – 4 hours traveling, you then have 3-4 hours in Hvar (which is not much) before last catamaran leaves back to Split, better option is to go with catamaran in the afternoon from Split, stay one night in Hvar and then return next day with catamaran. Regardless if you choose Split or Hvar you will for sure enjoy. – if you should choose to stay in Split, you could consider take the Buraline (small boat) to Trogir, which is a very beatiful UNESCO site. Hi Tanya, i think Split sounds to be the right place for you, of course the highlight is the old town / the diocletion palace. Venice is not possible on a day trip from Split, for getting to Venice you will have to go to Istria, which is +5 hours from Split. – what about visiting Mostar? Hi Andreia, unfortunately you will have to take the 5 hour bus drive. Just discovered your sight which is wonderful. My husband and I are thinking about visiting Split for a 5 day break for our anniversary in May. I’m afraid I don’t know Split at all so would like to know which area in Split you would recommend which is within reasonable distance to the sights, old town etc and also a sandy beach. I note that you’ve said there is one sandy beach in Split – could you tell me where that is and perhaps a couple of hotels that are fairly close. glad you like my page. My recommoddation would be that you stay either in the old town or in the city parts Radunica or Bacvice. If you stay in old town or Radonica, you will have majority of sights next door and the sandy beach Bacvice (Same name as the city part) is only about 15 minutes walk away. If you stay at Bacvice it would be visa versa :-). since this review was written have the prices for food and drink increased much? the prices for drinks and food have increased a bit, maybe 5-10% in average compared to the prices i state.